The Crimson Fists are getting reinforcements, hand over fist. My 1980s Rogue Trader Space Marine grows with the addition of another 5-man Tactical Squad composed of vintage metal and plastic Citadel Miniatures from another era. Squad Huerta, ready to put the huert on. 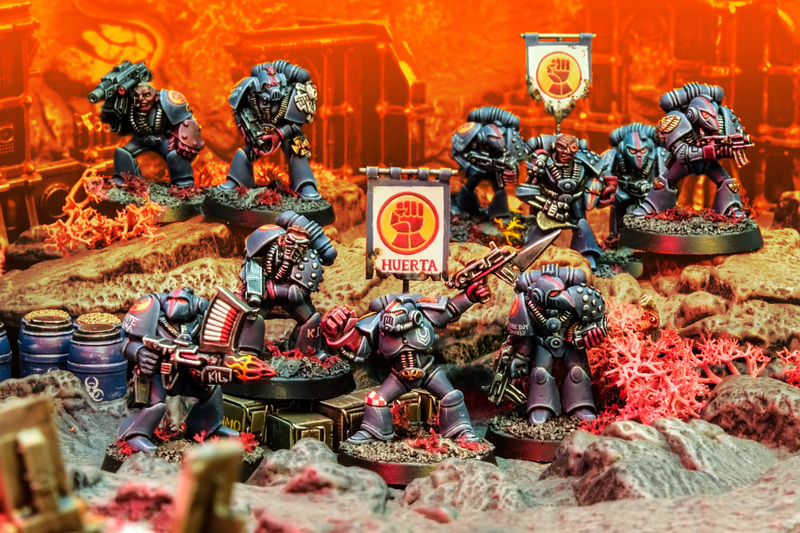 To my amazement and envy, in the time taken to finish this second squad of Battle at the Farm Crimson Fists, Nico has painted every Crimson Fist for the scenario, plus he's modelled an evocative scenic base, plus he's painted all the Orks and – if that wasn't enough – some Ork reinforcements. I feel like Falcon running round the park and being lapped repeatedly in Captain America: The Winter Soldier. Again I had some fun adding freehand chapter icons and armour graffitti to the squad. "THE TRUTH HUERTS" is just punning off the Sergeant's name. "INFINITE PLASMA" is a reference to the Battle at the Farm scenario, which Zhu points out gives the Space Marines unlimited Plasma Missiles (as they normally cost 1 point each, it technically means the Marines outclass the Orks by INFINITY POINTS). Here are the two squads in action alongside each other, with a sneaky eleventh Citadel Miniature tucked away somewhere … can you spot it? Squads Huerta and Onan fighting in the ruins of Blas in the Gallego system. 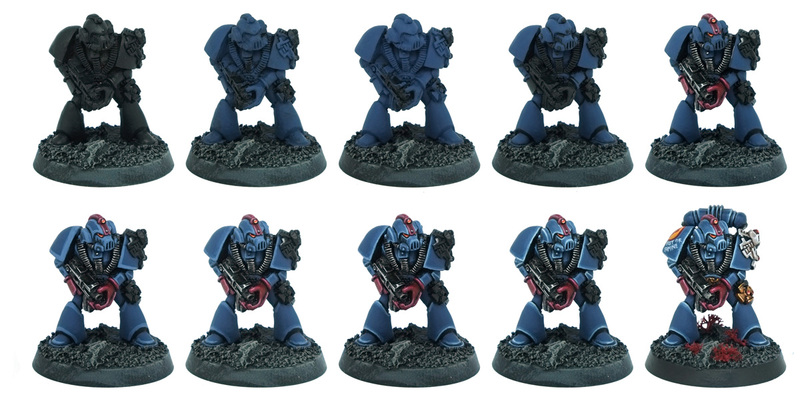 I've been getting a lot of questions about how I paint Crimson Fists, so I photographed a Marine inbetween each step of the blue power armour process. If you want to see these steps broken down, with the techniques and theory behind them spelt out the tutorial is available on Patreon. The skills you'll learn are transferable to all colours of power armour. 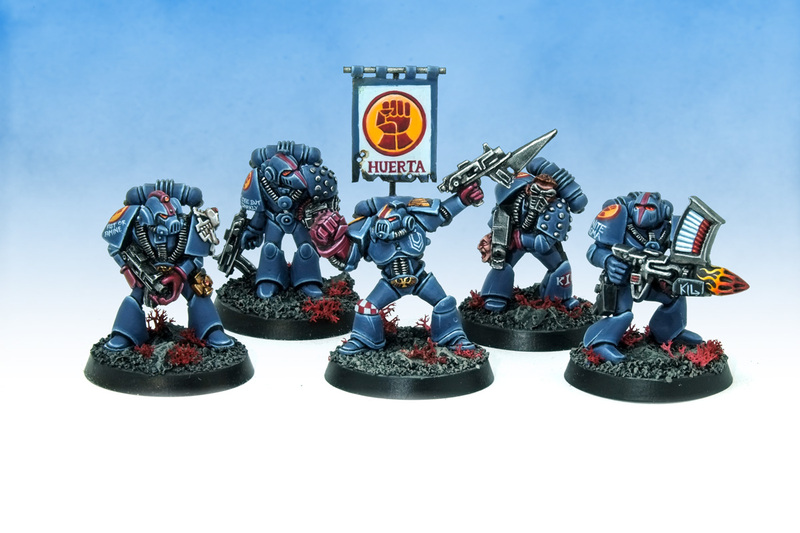 Coming soon – more vintage Crimson Fists to creep the army closer to game legal. Amazing work! Really inspiring Ninja. I'm in the process of building and painting a 40k Primaris army, your stuff gives me a great deal of momentum and energy to finish my own stuff! Good to know Baranovich! I'm working on some Primaris too at the moment. They're lovely models, but take longer than these smaller undetailed retromarines. Best of luck with them! Thanks for sharing this! This gives me a little bit of impetus to strip andcrepaint my old marines. I do see the 11th miniature. Very nice unit. Love the paint work. I think that the old RT era models are the most suitable choice for 30k games. I still have some of those guys on sprues. I'm doing things the other way, Primaris Marines in RT-era colors. Capt Flash – you really should get some vintage Marines in your life. Though stripping your own paintjobs risks destroying the past. Buy some more and paint them! Lion – You doing Rogue Trader era markings with helmet strips and all that jazz? That's top! Ninjabread- these were bought second hand. But Simple Green works wonders . @Ninjabread: That's the plan! Though I'm abusing the Deathwatch rules under counts-as for playing (which allows mixed squads of Primaris and stacking several different rules on top of each other ), the squads are all getting painted up as Marines Errant in an approximation of their Badab War camo (which is a rendition of German Splinter!). Heck, Yes! Great work and thanks for the links.